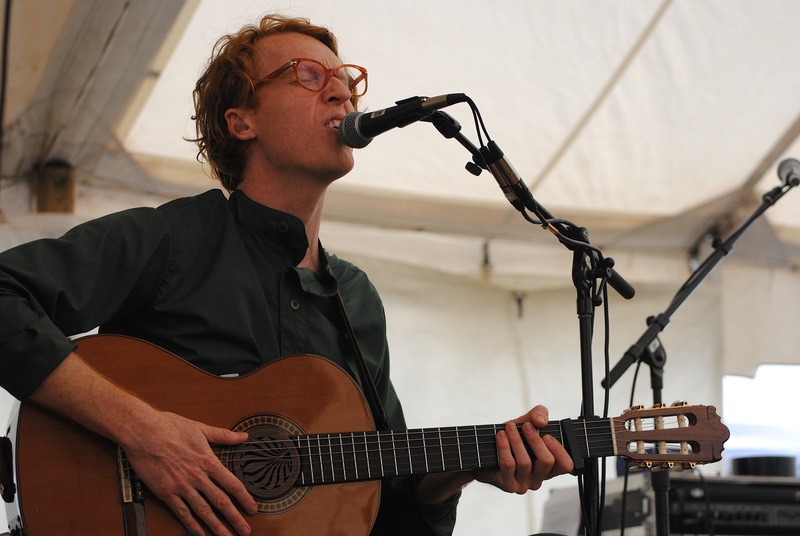 Although he’s recognized as a multi-instrumentalist that plays everything from drums and double bass to accordion and celesta in Arcade Fire and Bell Orchestre, when Richard Reed Parry performed his solo work at Hillside Festival July 28, he came onstage bearing only an acoustic guitar. Well, that and some friends. Performing his yeti sighting-rare and All Tomorrow’s Parties-retained “Quiet River of Dust” project at Guelph Lake with the help of Bell Orchestre bandmate Stefan Schneider on drums and Laurel Sprengelmeyer (Little Scream) on keys, Parry kicked off the first of three hours of Hillside programming from members of the two most publicized bands to which he belongs. Although he played the more sparsely attended hour amongst the block that also saw performances from Sarah Neufeld and Colin Stetson, perhaps not used to holding the spotlight onstage (although visibly comfortable, no doubt), Parry also called upon some collaborators to share the stage with. Performing a song he called “Gentle Pulsing Dust,” Parry invited fellow Hillside performer Dallas Good of The Sadies onstage to introduce his own voice and an electric guitar into the mix. Parry also announced the two of them have been working together on material on-and-off for some years (Parry, 35, also joked the process might mean the two won’t get around to releasing a full record until he turns 40, so there’s that, too). Sarah Neufeld – who, in addition to her own set, also performed in a special collaborative workshop with Parry, Colin Stetson, and Lee Ranaldo and The Dust at Hillside – also joined the performer onstage. While not a set highlight, immediately following Parry’s performance, a festival announcer told the audience that Arcade Fire would release a new album Oct. 29, to which Parry quickly responded with a “Shh!” over the mic. Of course, the release date of Arcade Fire’s upcoming record went public July 12 when the band’s Twitter account responded to a fan’s praise on Twitter with news of the album. Parry’s reaction to the Hillside announcement of that news suggests that perhaps not all of the Grammy Award and Polaris Prize-winning band was in the loop on or concerned with the promotion strategy (if that) for the new release. Or maybe he was just being coy. This entry was posted in Burden of Salt and tagged Arcade Fire, Bell Orchestre, Colin Stetson, Dallas Good, Gentle Pulsing Dust, Grammies, Grammy Award, Guelph, Guelph Lake, Hillside, Hillside Festival, Island Stage, Lee Ranaldo and The Dust, Polaris, Polaris Music Prize, Polaris Prize, Quiet River of Dust, Richard Reed Parry, Sarah Neufeld, The Sadies on July 30, 2013 by Tom Beedham.